Physician visits are an important part of your child’s healthcare management. Most mothers choose a pediatrician before the baby is even born…am I right? Yes, I did, too. 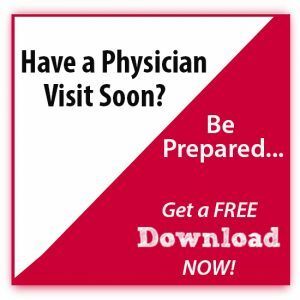 It is important for parents to understand the purpose and end result of all physician visits. Those visits may not mean what many you think they mean. 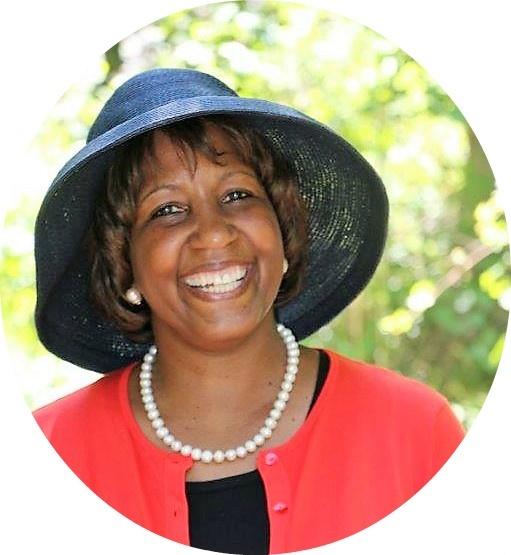 As a pediatric specialist, I am writing this post with a focus on the health of children; however, the information also applies to adults as well. Pediatricians and family physicians serve as our children’s primary care physicians. As the first level of medical care, they are meant to be the overall gatekeeper of your child’s care. 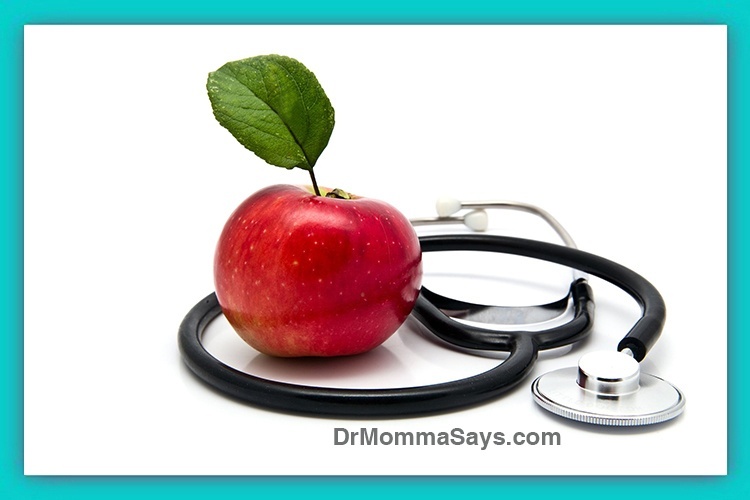 These physician visits are our first line of defense when Momma Medicine fails. 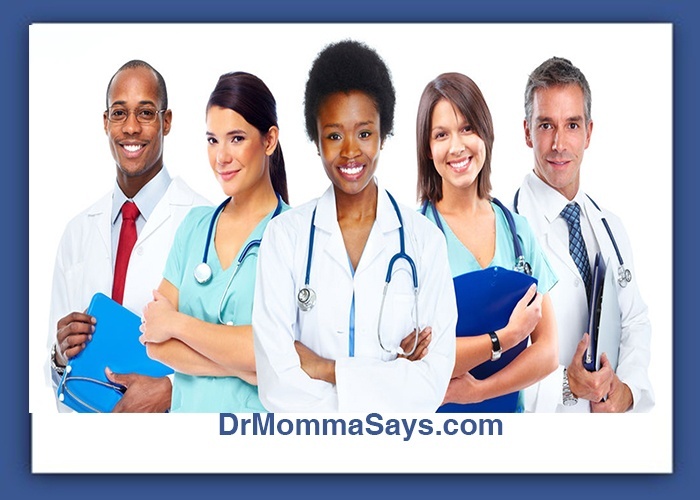 Since you remember how much research went into choosing your child’s physician, you definitely want to utilize her! Pediatricians are meant to be with us while our kids grow, and they are the guardians of our children’s medical records. Health records show the severity of illnesses and are used to decide if another physician should be consulted for your child. Primary care physicians should be your first choice for treatment if your child needs to see a medical provider. Please remember to ask for the credentials of your healthcare provider to ensure you are receiving the level of care that you desire. 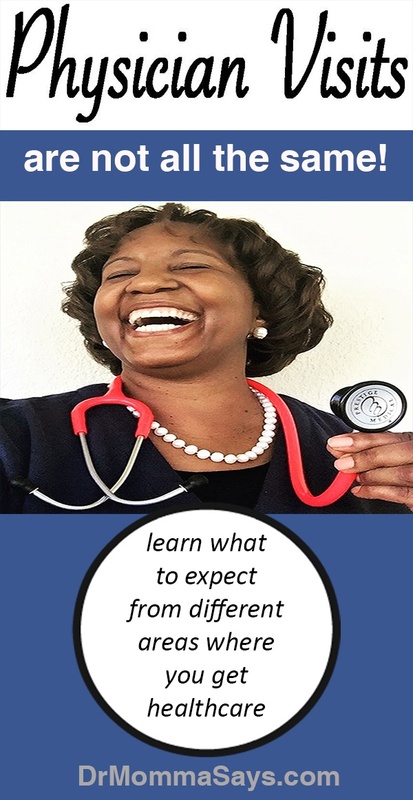 All healthcare provider training and experience are not equal. Urgent care physicians stand ready to take care of children when your primary care office is closed. The highly trained staff at urgent care centers examine your child but also have the ability to take x-rays and perform blood work. A wide range of illnesses and injuries are treated by these physicians. These centers should NOT be used for true emergencies. Do not take your child to an urgent care center with uncontrolled bleeding, or severe trouble breathing. Parents should check with primary physicians to make sure kids do not have medical problems best treated in emergency rooms. Patient’s seen in urgent care centers may pay higher co-pays than standard primary care office visits. Emergency room physicians train to take care of everything! These physicians treat everything from skin rashes to heart problems during one shift. My sister is an emergency room physician, and I still am surprised by all of her patients that she successfully treats each day. Patients wait longer to be seen if they have routine or minor illnesses because the priority is the unstable, very sick patient. Additionally, because of the higher level of care provided, patients pay the most money to be seen in emergency rooms. If your child has a problem normally treated by your primary care physicians, consider using an urgent care center. ​Traditionally, emergency rooms and urgent care centers serve as a second level of care when illnesses happen after hours. These problems cannot wait to be seen during normal office hours. After treating patients, these urgent and emergency care providers instruct patients to follow-up with their pediatrician to ensure the problem is resolving. These second care level physician visits are meant to be rare visits between the normal pediatrician visits. Specialty physicians (like me!) treat children when a third level of care is needed. We review the history of your child’s problem as well as all the treatments that have been used. Our assessments then determine if a procedure, surgery or more aggressive medical management is needed. Please remember that just because you are seen in a specialist’s office, you need to ask if you are seeing the physician specialist. Many office hires non-physician healthcare providers to assist patients in being seen sooner, but be sure to ask to personally speak with the specialist physician who has undergone all the extensive training that you are seeking in your appointment! ​These three levels of increasing physician visits, medical care and treatments worked well for many years. Until recently. Immediate care centers treat patients in many cities across the country. Another name for this health care center is a retail clinic because many are found places like pharmacies or Walmart. Although staffing can vary by location, most retail clinics are staffed by nurse practitioners or physician assistants, commonly called mid level providers. Fully trained medical physicians are not located in these centers. Urgent care and emergency rooms often provide physicians as well as mid-level providers. It is important that you call urgent care centers near you to check on providers available to see you AND to see the services offered. All urgent care and retail care centers do not offer the same services and it may cost you more money if you need to be seen in another center. Because the number of retail immediate care centers has dramatically increased, parents use these services more each year. Consequently, these centers have gained more popularity for treating problems which could wait to be seen during pediatrician office hours. Because these centers offer a fee schedule that can cost less than standard co-pays and hours that can be planned after school, work or weekends, some parents consider these centers to be part of their children’s health care management team. For an increasing number of children, these retail care centers replaced pediatricians. However, these centers are meant to simply treat new problems. It is not their job to determine when more advanced evaluations are needed since patients are expected to follow-up with pediatricians. If the problem gets better, many parents do not make appointments to see their child’s pediatrician for follow-up visits. Mothers frustrated about repeated illnesses want to advance their child’s care to a specialist; however, the pediatrician does not know the illnesses have occurred. Primary care physicians involved with repeated illnesses may treat with more than antibiotics which is main therapy given at retail centers. Repeated use of retail care centers with poor follow-up with pediatricians may lead to a delay in starting more aggressive treatments or specialist referrals. The potential exists for problems to become more advanced before moving to the next level of care. When patients come to my office, I often need more information than parents can provide me when they frequently visit immediate care centers. Many parents cannot provide accurate medical histories or reports how the problem has changed over time. Children were treated by different physicians at the same center. The same physician at the same center treated the child; however, different adults provided different medical history. 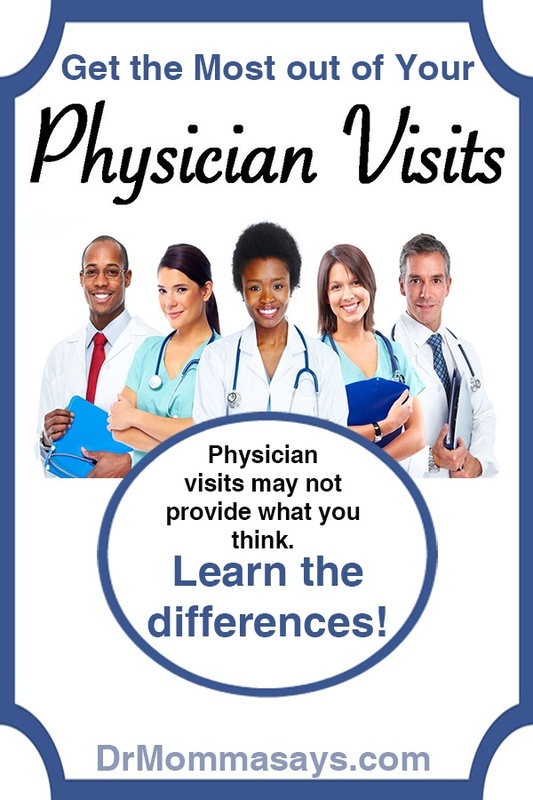 Medical charts may not be available to review even in the same center because the center is not the primary care gatekeeper. Parents lose the medical summary and there is no other record of what happened during the visit. Although recommended, the child was not seen by pediatrician the following week. Therefore, a plan was not made to prevent future episodes. At this point, once parents come to my office, they are ready to proceed with surgery. Without accurate history, therapies may need to be repeated and assessed. This is where reviewing the pediatrician records is invaluable. Remember to follow-up with pediatricians after immediate, urgent or emergency care visits. Because of the convenient hours and lower costs, I absolutely understand why these immediate care center visits are increasing. However, I believe it is important for parents to understand that these immediate care physician visits also bring an additional responsibility for personally managing and organizing their child’s healthcare. Because the pediatrician has frequently been taken out of the loop and no longer is the overall organizer of their child’s care, parents using immediate care physician visits need to take on this duty.